Day 1: Arrival and warm up. We’ll meet you and your bike in the afternoon at the Halifax Stanfield International Airport and bring you back to Truro, our quaint start town at the edge of the Bay of Fundy. If you get in early, get your bike ready and spin the legs out. Dinner is on your own tonight--explore Truro; we have suggestions if you need them. Shorter option: Take the morning to leisurely unpack your bike. Grab lunch in Truro and head out in the afternoon along the Cobequid Trail. Follow the rolling farmland along the Shubenacadie River to the Fundy Tidal Bore Interpretive Center. If we time it right, we’ll get to see the tidal bore before heading back to dinner. 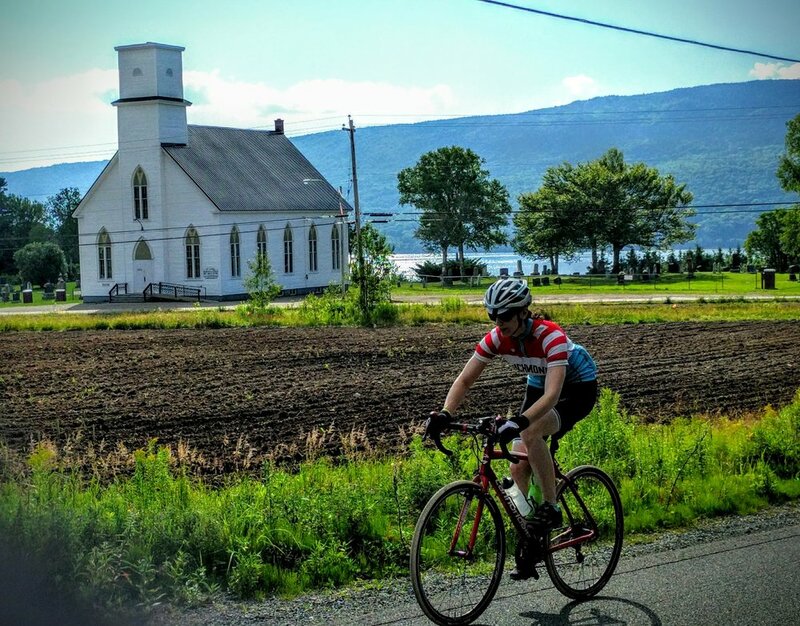 Longer option: If your bike is ready to roll early, head out along the Bay of Fundy, being sure to stop for lunch at Frieze and Roy’s in Maitland (claim to fame: “Canada’s oldest general store”) before heading back. You’ll have two chances to check out the tidal bore at the Fundy Tidal Bore Interpretive Center--on the way out and the way back. Food: Breakfast and dinner provided, lunch on your own. We’ll head out of Truro by way of Bible Hill (home to Nova Scotia’s most famous export, Trailer Park Boys) and use sections of Nova Scotia’s Blue Route as we wend our way northeast. Though we might take different routes, all roads lead to our picnic at Green Hill Provincial Park. The view will make the climb worth it! After lunch, we have lots of options to make our way to our seaside resort hotel. Shorter option: After our picnic, you’ll head towards the water and eventually to the Jitney Trail, which will bring us through downtown Pictou, the home of New Scotland. Longer option: After our picnic, you’ll head into the rolling farmland of Pictou County. Be sure to stop for an ice cream at Deb’s Hidden Cafe in Scotsburn. Food: Breakfast and dinner provided at the hotels; a picnic will be provided at Green Hill. Yes, the lifeguards mean that you are supposed to swim there. Many possibilities are on offer today. The easiest--and maybe wisest--thing to do is to leave your bike alone and enjoy our amazing seaside resort. Other restful opportunities include heading to the town of Pictou for lunch and taking a dip in the Northumberland Strait (these are purportedly the warmest waters north of North Carolina). After leaving Pictou Lodge, we’ll take various routes along the coast and make our way to Rushton’s Beach Provincial Park for a picnic. After lunch, we’ll go our separate ways...but all come together again in Tatamagouche at our incredibly unique hotel, a restored train station. Shorter options: Whether you take the pavement or the dirt, today’s route wends its way towards River John and then Rushton’s Beach. After our picnic, you might choose to swim at the park and take the more direct route--whether road or gravel--to Tatamagouche. Alternately, you might want to get to hotel and get set up early at Tatamagouche Brewing Company, a few short blocks away. Longer options: If--after our Rushton’s Beach picnic--you’re still feeling feisty, take the long way home. Whether dirt or road, the long, winding routes offer some climbing up through the hills (keep your eye out for windmills). Be sure to stop at the Earltown General Store to refuel. Bonus: if you’re extra motivated, the Balmoral Mill offers a chance to learn something about the region’s Scottish settlers. Food: Breakfast and dinner provided at the hotels; a picnic will be provided at Rushton’s Beach. Today offers an option for rest and recuperation .... if you're wise enough to take it. Get a coffee, then a massage, then lunch, and then a beer and you’ve had a great day in Tatamagouche. If you’re up for a ride, though, you’ve got lots of excellent choices. Shorter options: The pavement-only route hugs the shore along Tatamagouche Bay. You’ll pass Blue Sea Beach Provincial Park on your way to Jost Vineyards (where you really ought to stop for lunch). The gravel route, in turn, heads for the other side of Tatamagouche Bay for a short out-and-back to the Country Bread Basket for lunch. (Note that there are paved roads to the Country Bread Basket, too!). Longer options: A road-only route takes you along the Northumberland Strait to Pugwash, where you can grab lunch and check out the Thinker’s Lodge. The gravel route, in turn, is a leave-nothing-on-the-table option for folks who have more energy than sense. Head to Debert, then back via the ski area at Wentworth. You’ll be ready for several cold beers in Tatamagouche if you take this option. Today might be our last ride, but it’s not our least ride. We’ll climb gently all morning up and over the ridge before dropping into Sugar Moon Farm for a snack (or lunch). We’ll then make our way back to Truro, pack for the trip home, and enjoy a last dinner together. We'll head to the airport, but not before having one last breakfast together. Food: Breakfast is at the hotel. * Please note this legalese: all routes are subject to change, depending on weather, road conditions, and other factors.